I’ve heard that more than once from various people, especially during this holiday season. So if you’re one of those who might have said that – or if you’re one of those who started following the blog in the last couple of months – here’s your chance to catch up. 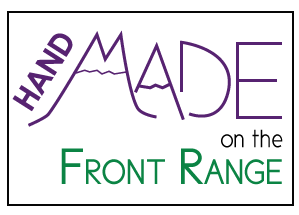 I’ve compiled a list of all the posts that have come out since “Handmade on the Front Range” began the first week of August, 2014. A few words give you the idea of what you might have missed. Just click on the date and enjoy! December 24 Do You See What I See? Scroll through photos you haven’t seen before that were taken when I wrote previous posts. They didn’t quite fit the content of the original post, but they’re great fun. December 17 J.C. Milner Metalworks: Serious Work, Playful Art. Jennie Milner designs and creates whimsical jewelry using sterling silver, often with resin or copper to add color. Jennie also puts her zany art on walls by commission and in mail by subscription. Not the blog’s usual fare. I offered my secrets to making and enjoying light, tender scones at 5,000 feet. Fran Bowen uses a dry felting process to create adorable animals and other figures from wool. Her custom work has included dogs smaller than your hand to commemorate beloved pets. Published the day before Thanksgiving, this post acknowledges you — my reader — and others who make this blog possible. It also kicked off the holidays with seasonal photos of artisan work. Mickey Ramirez makes felted wool hats with spots from the natural-colored wool of the spotted sheep she raises. Show of Hands is a gallery in Denver’s Cherry Creek North owned by Katie Friedland and Mandy Moscatelli. It carries the work of artisans in Colorado and beyond. This post ended a series of four on where to buy handmade items any day of the week. The Evergreen Gallery, owned by Lisa Gibson, offers not only beautiful work by Colorado artisans but also an opportunity for a day’s getaway in the mountains. Jacki Marsh stocks wearable art, wall art, and home décor at her Loveland shop, where almost everything is made by local artisans. October 22 Trimble Court Artisans Offers Convenient Holiday Shopping . . . This was the first in the series about places where you can buy something made by an artisan anytime you want. Trimble Court, located in Fort Collins, is an artisans’ co-operative, where one of the artisans is always there to help you. October 15 A Summer Afternon in Fort Collins Means Fun for Children . . . Motivated by his desire to have affordable wooden toys for his own children, Aaron Nuland makes toys of natural-colored wood for infants and older. A Summer Afternoon is the name of his business. October 8 Kristin’s Clothes Line and The Pink Moose: Stories from Severance . . .
Kristin McMahan and Jennifer Kalous have at least two things in common: they both live in Severance, Colorado, and they both make handcrafted items by upcycling. Kristin turns pillowcases and dresser scarves into dresses for little girls. Jennifer creates furniture and home décor from every interesting previously used material she can find. Holly Myers creates animals, both real and mythical, using wool felt, embroidery floss, and her own patterns. Pat Abbitt makes colorful stuffed animals with cotton quilting fabric. Numerous lines of stitching add dimension and depth to her work. September 17 Glassblower Dottie Boscamp Gives a Modern Twist to an Ancient Art Dottie Boscamp’s uses some of the tools that have been wielded by glassblowers for millennia to create her contemporary work. Gayle Stringer creates necklaces, bracelets, and earrings from glass beads she painstakingly makes herself by the heat of a torch. Kathi Dougherty shares her joy in making fused glass art by making her home studio available to the public. I tried the art myself and found the fusing process magical indeed. August 27 Transforming Clay from the Simple to the Sublime . . .
Three ceramic artists in Fort Collins — Heather Bartmann and Cindy O’Neill of 2 Clay Chicks and Chris Wolff — shared some of the secrets of their work from clay to kiln. August 20 With Fiber, Wire, and Strips of Glass, Megan Tilley Weaves Her View . . .
Megan Tilley decided to major in sculpture . . . but her first class in weaving hooked her on fiber art. As her artistry developed, she found ways to incorporate both fiber art and weaving with sculpture. She expanded her art even further by making jewelry. Anne Bossert was a fiber artist before she began making furniture to highlight the textiles she wove. Now she uses the same dyes to color both wood and fiber. Fort Collins Studio Tour took place one weekend in June. This post explains how the tour worked and introduced the series about artisans I met on the tour. It also includes the first artisan I met: ceramic artist Susan Sternlieb. Wow! That was fun to recall all the delightful, talented people I met and all the amazing work that I saw. I’m looking forward to a new year with many more. Have a happy one! This entry was posted in Other and tagged 2014, synopsis on December 31, 2014 by Sally.